Here’s a photo from my vacation in Washington DC. I’ve been meaning to post for some time now, but just went thru the pictures to find something appropriate for the blog. 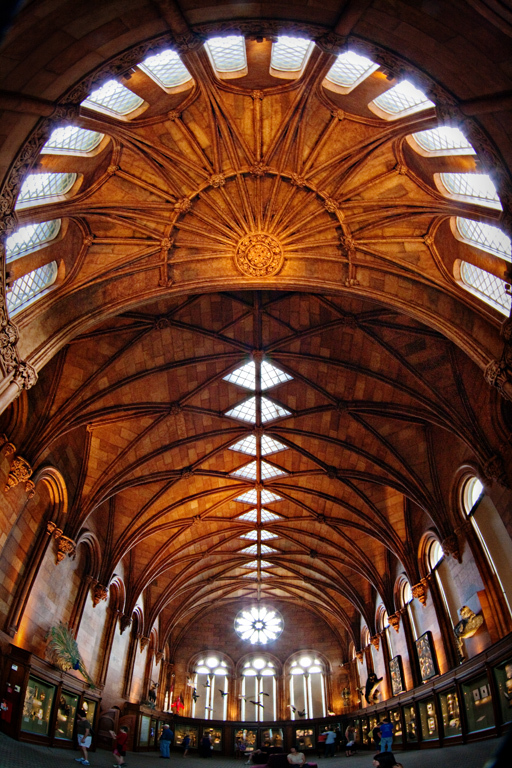 (Thanks for the encouragement, you know who.. :)) The ceiling is from the Smithsonian Castle. I love the lines and the symmetry. This was taken with a Zenitar 16mm fisheye. ISO1600 at 1/5 sec, and I believe F11 or F8. My sister and mom are in this picture. Can you spot them? Every time I miss home, I can either look at family pictures, or I can look at this photo and be humbled. 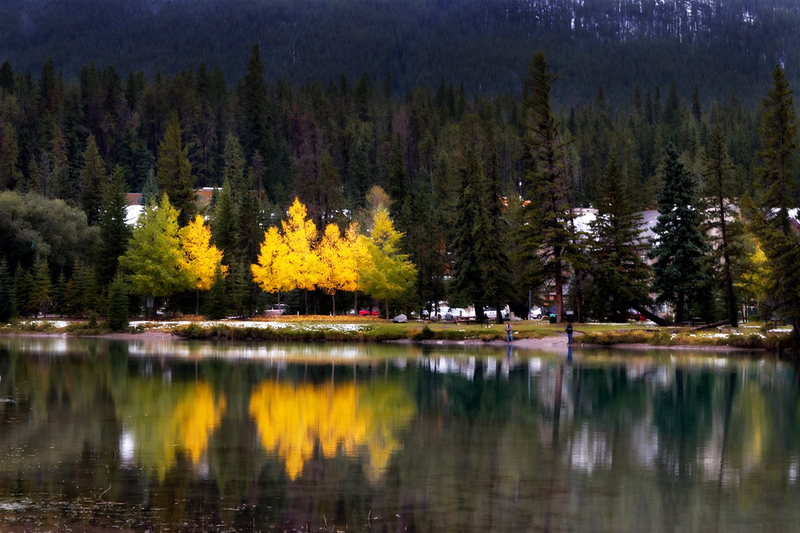 Banff is an amazing little city a short drive from Calgary, Alberta. It amazes me every time I go back to see nature at it’s best. This photo was shot about 3 years ago– I’ve been meaning to post it for ages on this blog, but didn’t think the middle of summer was appropriate to post this 😉 I hope you enjoy it. It was shot with a Canon 20D with a Tamron 28-75 f2.8 lens. Shot at F11, at 59mm. Fort Worth has some interesting western scenery with the stockyards. It was fun to shoot Anna there this weekend, along with the friends from the Dallas Photography meetup group. Anna was an excellent model and had great poses throughout the photoshoot. 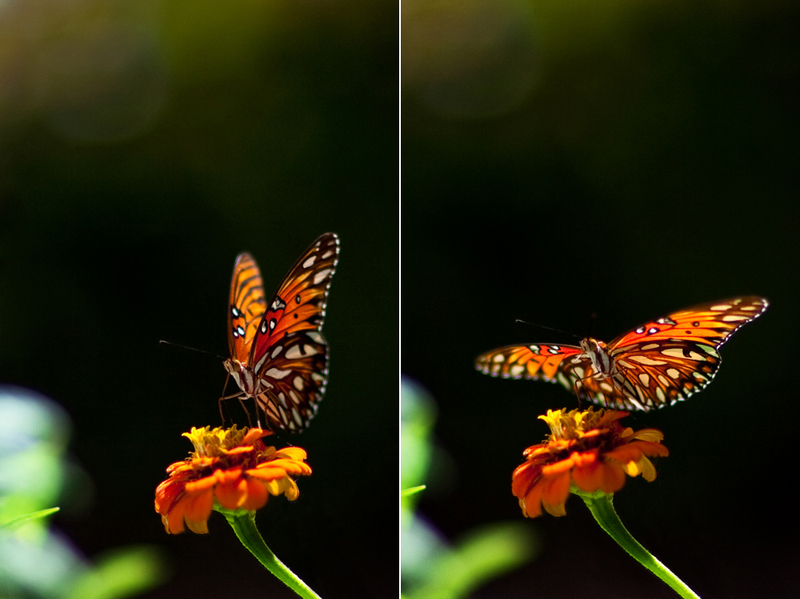 The photos shown here were shot with the Canon 1ds Mk2, using an 85mm f1.2 lens. On the evening of August 1st, my family and I were in New York City. 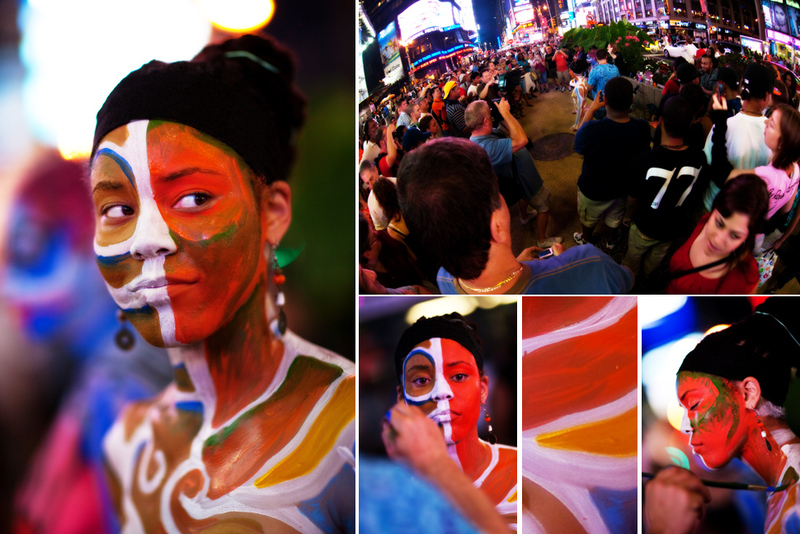 In the evening we ventured to Time Square, and witnessed this little body painting show. It is a very interesting art form. I must say it takes a lot of guts to do this in the middle of Time Square. Wide angle image was taken with a Zenitar 16mm fisheye, and the portraits were taken with the 85mm 1.2. Today was a new addition to my family… a bright shiny Canon 85mm F1.2 L II lense. These above images were taken with it just after I returned home from work. VERY lucky shot, because 1) there are not many butterflies around this time of year 2) the timing of it being at my front door while I received my new lens 3) the fact I had the camera ready… It was meant to be! Such a beautiful butterfly. These were cropped from the original, shot at 85mm at f1.2, ISO 100, at 1/4000 of a second. Shot on a Canon 1ds Mk2. 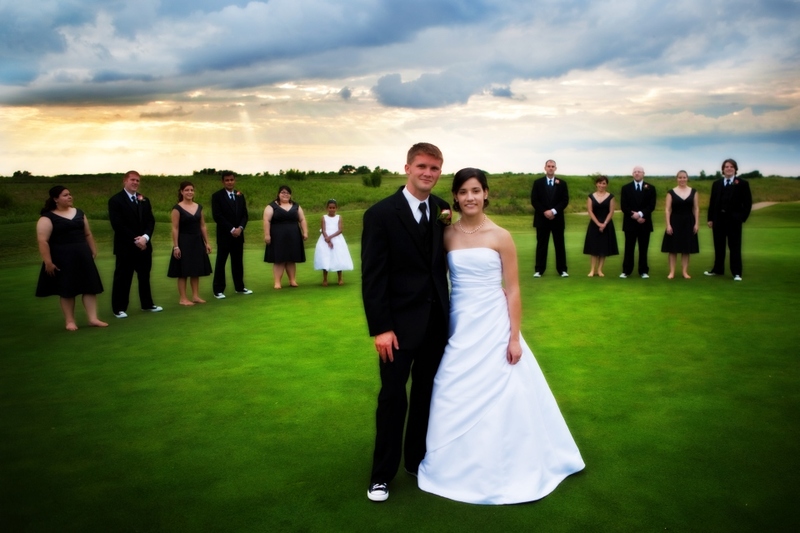 The Tribute Golf resort in The Colony Texas provided a beautiful backdrop for this image. I love the way the clouds came in a provided a bit of extra drama to the scene. 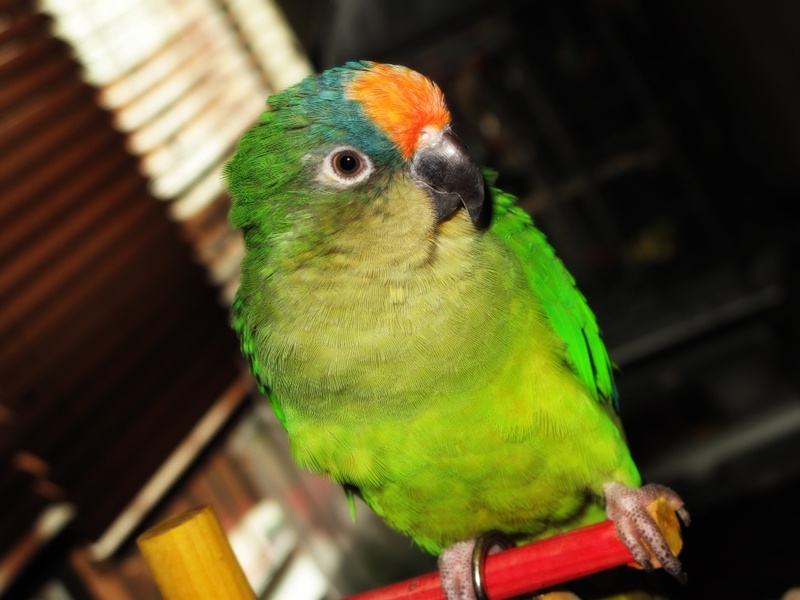 Peach Front Conure – Lola! This is my peach front conure Lola. 5 years young, she’s always a little sweetheart. She loves to laugh, sing, and she can recite entire texts from memory 🙂 She’s a wonderful and playful parrot. Here’s a really neat way to do a thank-you card for your wedding. I took this photograph at the Tribute Golf Club on May 22nd. Julie and Jordan make a really cute couple, and I wish them the best of luck!